A black and white photograph looking southwest from All Saints' Anglican Church Steeple. This view looks southwest from the steeple of All Saints' Anglican Church at the north west corner of Dundas Street and Centre Street. 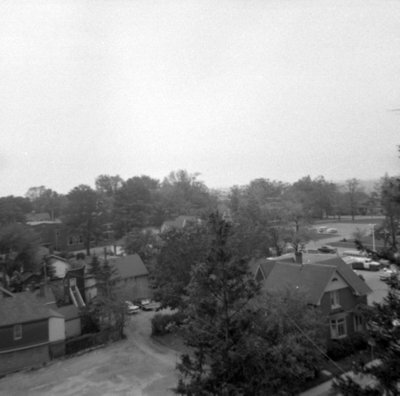 Looking Southwest from All Saints' Anglican Church, May 1964, Brian Winter. Whitby Archives A2013_004_344.